You know that giddy joy and splash of childlike pride that can come with realizing you can create something you would typically buy, authentically and all by yourself? Sometimes it goes both ways. In a world of dominant and domineering big ag and junk food marketing, it doesn't happen too often. But sometimes you find a gem, and can't help but get excited about having the opportunity to support a company whose pure ethos and dedication to quality invite you to stock up on wholesome delicious products when you can and save yourself some time. That's how I feel about Made in Nature. I got to attend a blogger event at Made in Nature headquarters in Boulder the other night, and I'm still catching myself by surprise at just how fun it was. It isn't always easy for me to get out the door evenings, on a weekend let alone a Tuesday night. But this was well worth placating the weary plea for PJs for. For one thing, we got to play with food. You know how I feel about that. Even better, it was guilt-free treat food, and it came with real, pleasant adult conversation. It was all the tactile joy of a preschool playdate with the relaxation of a girls' night. Bonus, I got to learn more about a real cool company while making my own version of truffles with date and apricot paste. Our family just got acquainted with Made in Nature literally weeks ago, when we received free Figgy Pop samples while walking around Pearl Street Boulder Film Festival weekend. I recognized them immediately as exactly the kind of snacks I delighted in making when Felix was a toddler...only these came in more flavorful variations, were prettier, and overall more perfect. Felix was an immediate fan. Reading their packaging alone, I felt like I'd found a friend. Even before arriving at the event--knowing we'd be getting to do some fantastic food play--I had it in my head that I was going to experiment with some kind of Figgy Pop inspired pie crust. Whether I ended up smushing a bunch of Figgy pops to a pie plate one day or made a similar concoction, I just loved the idea of exploring tweakable possibilities for mixtures that could do double duty as snacks and filling bases. But faced with the assortment displayed on the table we worked around, I couldn't resist the heady invitation to just play, and before I knew it "pie crust" became "truffle". A 'salted caramel' snack sphere made of apricot and date paste, almond butter, and a delightful crunch of crispy quinoa that was then dipped in melted dark chocolate and given a touch of quinoa. Mmmm. I kind of swooned over them--and apparently the Made in Nature chef approved too, because he chose them as his "top pick" of the night to my glowing surprise. That gorgeous temptation I described above? Recipe is not here. Neither is the yummiful hemp crunch ball with chocolate and almond chunks rolled in hemp seeds. But you can figure them out and improve on them pretty easily. I wouldn't want to deprive you of the play. What recipe is here then? That pie I promised myself I'd make. You've doubtless seen one much like it before. Chances are the filling was bulked up by avocado, and as much as I love the fruit, I just can't get wholeheartedly on board with the chococado combo. First bite? YUM. Aftertaste...I'd really much rather have my chocolate and my guac, blissfully separate. 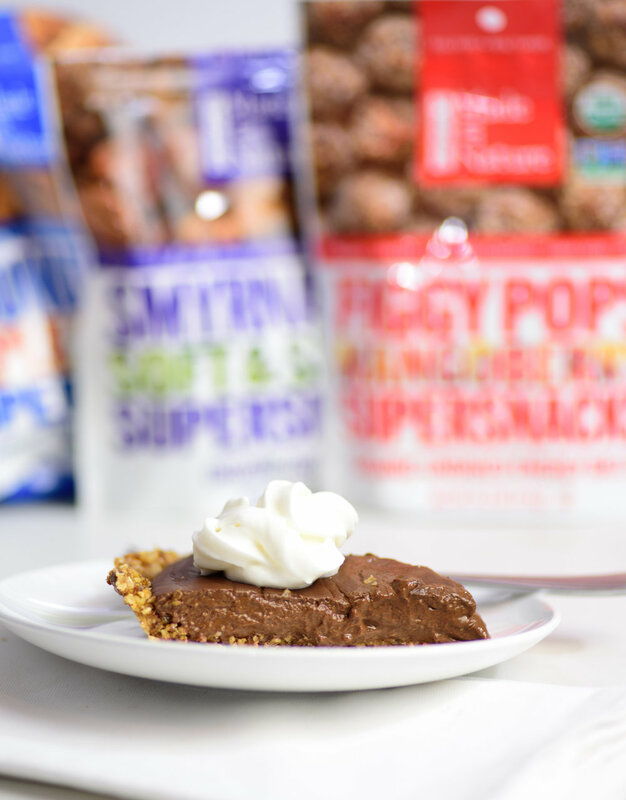 This Figgy-Pop inspired chocolate pudding pie is silky and luxurious, made of wholesome ingredients with no refined sugar, plus gluten-free and vegan. The filling owes its sturdiness to faithful tapioca flour again, whisked into almond and coconut milk with unsweetened cocoa powder and melted dark chocolate. The crust is playfully adaptable with full notes of Figgy Pop inspiration you can make your own. Fold in some brown rice crisps or toasted millet for a little extra crunch. This would be amazing topped with some Made in Nature coconut chips over a dollop of coconut cream. Enjoy! ¾ cup roasted almonds, coarsely chopped/1/3 to half cup almond butter? Place almonds and oats in food processor and combine on low until almonds are coarsely chopped, about 30 seconds. Add dates, figs and orange juice to processor (plus toasted millet if using), and blend on high until mixture begins to stick. Pause as needed to scrape down sides with a spatula. With clean (!) damp hands or the back of a spoon dipped in cold water, press into pie pan working way up the sides. Set in freezer to chill while preparing filling. In a medium saucepan, pour in coconut milk and heat on medium. Add chocolate chips and continue heating until melted, stirring constantly. Whisk in cocoa powder and tapioca flour. Continue cooking and stirring or whisking constantly until mixture has thickened, about 10 minutes. Stir in vanilla. Pour pudding into crust and refrigerate overnight, or place in freezer 1-2 hours before serving.